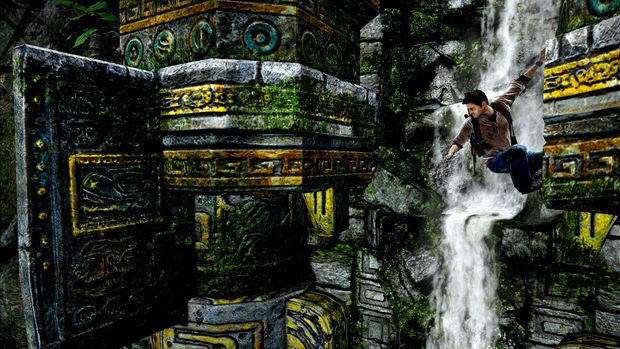 Leading into E3, Sony is finally ready to reveal details on Nathan Drake's first handheld adventure. It's called Uncharted: Golden Abyss, and it's headed to Sony's tentatively-titled Next Generation Portable and being developed by Sony's Bend Studio. 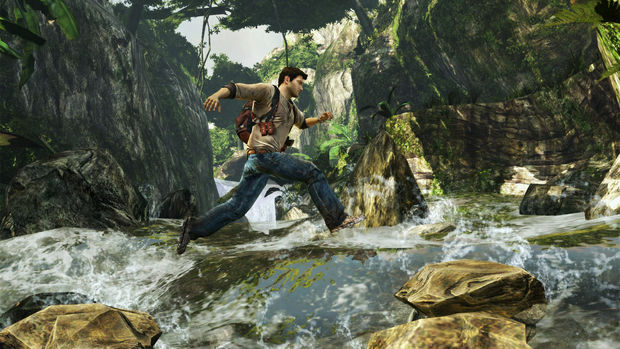 Set before the events of the PlayStation 3's Uncharted: Drake's Fortune, Golden Abyss is a wholly new adventure, not a port. This is something that Sony Bend emphasized multiple times throughout the demo, stressing that the game also can't be considered a prequel… despite taking place prior to the first title in the series. While Golden Abyss will introduce you to new characters and new locations (what we saw was a jungle ruins environment atypical of the series), it'll most certainly feel familiar to fans of the series. If you've seen the early gameplay footage of Uncharted on the NGP in action, I needn't tell you that it looks fabulous. But I will anyhow, because it bears repeating: it looks fabulous. While it doesn't quite match the visual fidelity of the consoles, it comes damned close. Both demo areas we were shown depicted lush jungle environments, with striking backdrops supported by spectacular dynamic lighting effects. Drake's movements are smooth and detailed, including the series' trademark facial animations as voice actor Nolan North effortlessly delivers his lines. To nail the look and feel, Naughty Dog has opened its Uncharted 1 and 2 animation libraries to Bend, to the tune of some 3,000 separate animations. There are even advanced water shaders at play; when Drake walks through water he gets wet, emerges soaking, and slowly dries over time. Bend's creative director John Garvin tries to put it into perspective with some numbers. He says that compared to its PlayStation Portable title Resistance: Retribution, which had 50,000 polygons per frame, Golden Abyss features 260,000. Retribution had 10 megs of textures, Golden Abyss has 160 megs. Bottom line: Golden Abyss lives up to the visual hype, and looks great on the NGP's mammoth 5-inch screen. Hands-on with the game, it feels decidedly like an Uncharted game, which should come as no surprise. The dual sticks on the NGP have let Bend essentially map the controls as they were on a PS3 DualShock. It's immediately familiar, and was easy to play for an Uncharted veteran like myself. The studio is taking things a step further, though, supporting a full range of control styles specific to Sony's new handheld, with mixed results. For example, you'll be able to use the touch screen by tapping context-sensitive on-screen buttons to engage in combat. Some of these touch melee options had you using various gestures beyond simple taps, like an upwards swipe. Like all of the game's touch-screen functions, you can ignore this altogether and use more traditional button controls. Or, if you're feeling saucy, mix them up depending on your mood. Touch also comes into play in the game's platforming; instead of using the analog stick to direct Drake as he moves up a wall, you can simply touch or swipe upwards across hand and footholds. The game was surprisingly smart in knowing what you were trying to do, perhaps too much so. There were a few cases where I used it simply to figure out my next move. Rather than trying to map out my path and move Drake accordingly with the analog stick, sometimes it was just easier to randomly swipe up a wall and let the game do the rest. There were areas where I could even tap on a ledge to make Drake hop to it, timing or skill be damned. 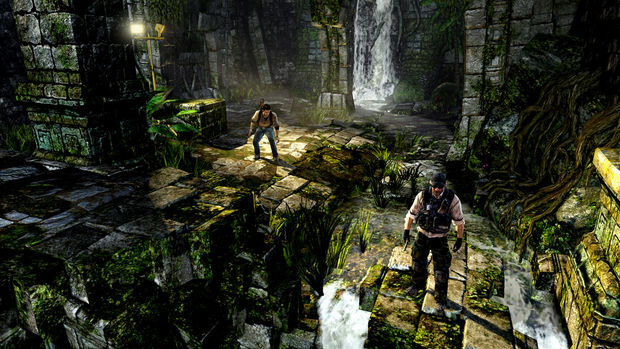 Golden Abyss also used the NGP's accelerometer (or as some devs surprisingly referred to it, "SIXAXIS controls") in a number of ways. In the first example I was tilting the entire unit in a single direction to make Drake lean out and reach towards a ledge when platforming. The second time I was able to use it was in a firefight when using a sniper's scope. Instead of controlling the reticle like in a traditional shooter, I had to move the entire NGP unit to aim at my target. I personally didn't find any of this motion stuff to my liking, particularly this sniper targeting -- I was quickly reminded of the ill-conceived forced flight controls in Lair. Fortunately, like other gesture- and touch-based controls I encountered, I'm told this is entirely optional and can be disregarded or turned off altogether. One thing you'll probably have to use the touch screen for, however, are some of the game's puzzles. In one sequence, I had to use my finger to "rub" a charcoal etching on a series of four tablets. Once completed, I put the pieces together with my fingers jigsaw puzzle-style to reveal a clue that was key to the game's story. This kind of puzzle felt right within the game world, not forced or unnecessary like I found some of the other touch and gesture controls. I hope to see more throughout Golden Abyss, perhaps some that require a bit more thought than simply shuffling around four bits of paper or rubbing the screen. In terms of the game's story, Bend wouldn't say too much. In one of the two demos (one heavy on combat, another heavy on platforming and out-of-context narrative), Drake was working alongside a new character named Jason Dante. Older than Drake (but younger than Drake's friend Victor "Sully" Sullivan), this dark-haired adventurer talked like a New Yorker, likely from the Bronx or Brooklyn. From conversational context, there's history between Drake and Dante, with references made to previous adventures. The vibe between the two is not entirely contentious, but there's certainly a small level of distrust between the two as they casually argue with and poke fun at one another. As for whether or not we'll see faces familiar to the Uncharted universe, Bend's not talking. Sully seems likely, but considering love-interest Elena Fisher and Drake first met during the events of Drake's Fortune, the blonde reporter isn't likely. It's possible we'll get more insight into the relationship of the Australian Chloe Sullivan, which is hinted at in Among Thieves. For now, it's pure speculation, but I'd expect a few familiar faces throughout the adventure. Whatever the case, Bend's doing everything it can to make Golden Abyss as cinematic and close to the "Uncharted experience" as possible. The studio is working closely with Naughty Dog, including creative director Amy Hennig, to make sure both the characters and stories are authentic. Bend is promising over two hours of movies to help tell the story, even utilizing the same mo-cap and sound studios used for Drake's Fortunate and Among Thieves. 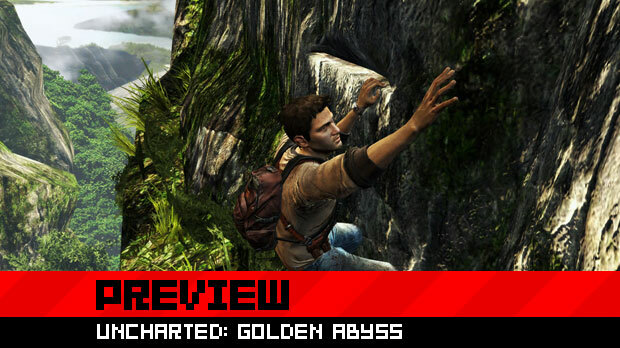 Uncharted: Golden Abyss is out... well, I don't really know. Sony hasn't even officially announced the final name of its new handheld, much less a release date. With E3 next week, we should know more soon, so stay tuned.